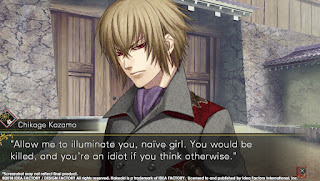 Almost a year ago, the otome visual novel Hakuoki: Kyoto Winds blew on to the PS Vita, bringing with it the first half of Chizuru's tale. Edo Blossoms picks up right after the events of the previous game. I was a bit caught off guard that you just pick a route to start the game. I expected it to read the save file, and would maybe put me on one that I would have been on. Thinking about it, what actually happens does make sense. It would be strange to only allow people to play the routes they had started, especially if they didn't even own the first game. Yes, the routes would make more sense, but since this is an expanded re-release of a previous version with new routes, there are probably some people that are more interested in seeing the endings to the new routes. Since there was no real reason to limit their customer base, I'm glad they did it this way. It would have been nice to know that before, since I was keeping Kyoto Winds on my cramped Vita memory card, ready for Edo Blossoms to use the save file. It turns out I didn't need to do that. D'oh. Once starting a route, you get a very concise recap of the previous game, which also covers the start of whichever route you picked. Like most visual novels, the game is very dialogue heavy. The protagonist's lines are not voiced, but most of the other lines and characters are. There are still images to accompany people talking, and special CG pictures at certain points in the story. These can be viewed later in the gallery. At several points in each route, there are choices to make, which affects the ending. While I was going through my first route, some of the characters and developments didn't feel quite right. It kind of felt like an actual sequel, and one that was made by a different person. Toward the end, I realized that some of these were supposed to feel like that. Others were probably just me not remembering things from the Kyoto Winds. After playing through two routes, I realized that I really liked Edo Blossoms, even more than Kyoto Winds. While that one had a more unified story for the first four chapters, each route here felt different. Not much was repeated, which makes it more interesting to go through many or all of the routes. I even have the urge to play at least the final chapter of every route in the first game, so I can more logically finish all of the routes in Edo Blossoms. Like the first game, each route is only a few hours, but with 12 different ones, it will take you awhile to go through them all. 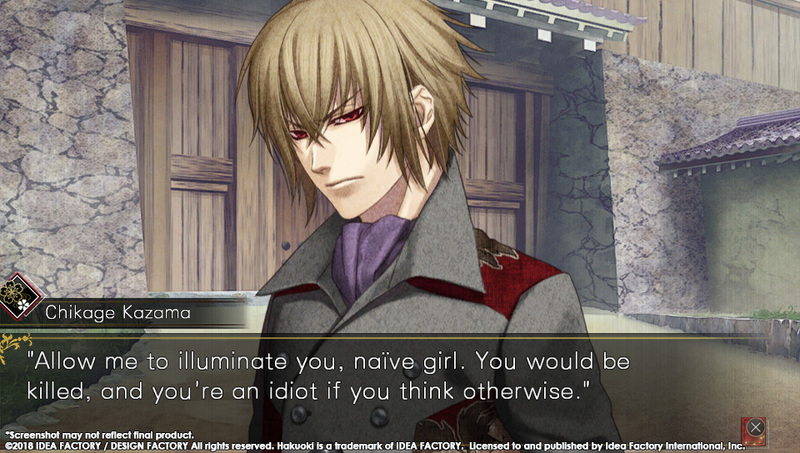 Visual novel fans should definitely check out the enjoyable conclusion to Hakuoki with Edo Blossoms. Finishes off the story started in the previous game, and the routes vary much more than that release. Easiest way to follow the routes is jumping back and forth between this and Kyoto Winds. Looking at the file sizes on the Vita's memory card, I can see why it was split into two games. Even with less redundant data, the game would be massive, and wouldn't fit on a cartridge.